A truly tricky tutorial to teach riposte! As some of you may have noticed if you play Desktop Dungeons regularly enough, roughly two days ago we released a patch! It's an absolute boatload of bugfixes, a few small balance changes, a much needed Scrooge buff, a lot of Curious dungeon upgrades! There was just one problem with that update: We accidentally included the still in-development fragments of the South's badge. For any who did see it, I suppose we'd like you not to spoil it. It is going to be a lot prettier and probably a bit different by the time it reaches actual release, so ideally we'd like people's first impression to be of the actual final product. Request aside, we realized our mistake the next morning and quickly moved to fix it. We stripped the unwanted parts from the version, prepped a new patch, and released it. There was just one problem with that update: We accidentally stripped too much away. So those who updated the day after the patch were now stuck with a version that worked mostly perfectly. That is, perfectly apart from not pulling up a menu on the start screen and thus being utterly unplayable. Fortunately, we realized the error of our ways yet again, and released our third patch (in as many days) which now *finally* works. All of the above to say, we're so sorry if you experienced any of these troubles in the past few days. If you launch one more time through the updater, it will put you on the current working version. In other news, QCF forum user shade_of_ox, who some of you may recognize, has joined the team as a coder! While this development is extremely recent and thus he's still learning the system, we hope that his work will help speed up development meaningfully. Also, the mod is now fully GoG compatible! Thanks to the final standard Desktop Dungeons update at last going through there, any who use GoG can now copy game files installed from that platform to play the mod without issue. Lastly, with this released, we're now finally able to get back to purely working on the South. When the player was ensnared, some dead monsters kept haunting the dungeon with their regen animation. This is now fixed. Fido was bugged, making him much more powerful than he was supposed to be. He has been brought back to the correct, much more balanced version. The One Horn has been made easier to use: the bonus resistances and corrosion are now automatically granted at level up. It may receive changes in future though. Casting IMAWAL on an empty tile with the Bag of Tricks used to allow current mana to go beyond max mana. Dragging the item in the inventory and back to its position also could cause misfire, but no longer. Brown Goop was canceling Assassin's Swift Hand. Membership Badge Conversion Points has been reduced from 75 to 50. Dispersion Seal has improved mana prediction with overcharge, and is no longer wasted when another pickup (sparkle, blood) was present on the same tile as the booster. In Phantom Citadel, the 4 generals can no longer be petrified or killed with slayer wand. After testing the difficulty was deemed to be at the right place, so it won't be nerfed. Sorry! Killing the Sacrifice in Lekon's Table by popping a burn stack while in a subdungeon no longer crashes the game. In a certain dungeon, in certain circumstances, it was possible to buy the same item twice. This is not possible anymore. Changed Pisorf interaction for a certain boss's last form. The Riposte puzzle has been fully remade. A new and improved solution to Heavy Reading has led to an increase in boss health. A more elegant solution has led to an increase of boss health by 1 in the Ensnare puzzle. 1 health removed from The Grandmaster so that Horatio no longer cheats death in the most infuriating manner. 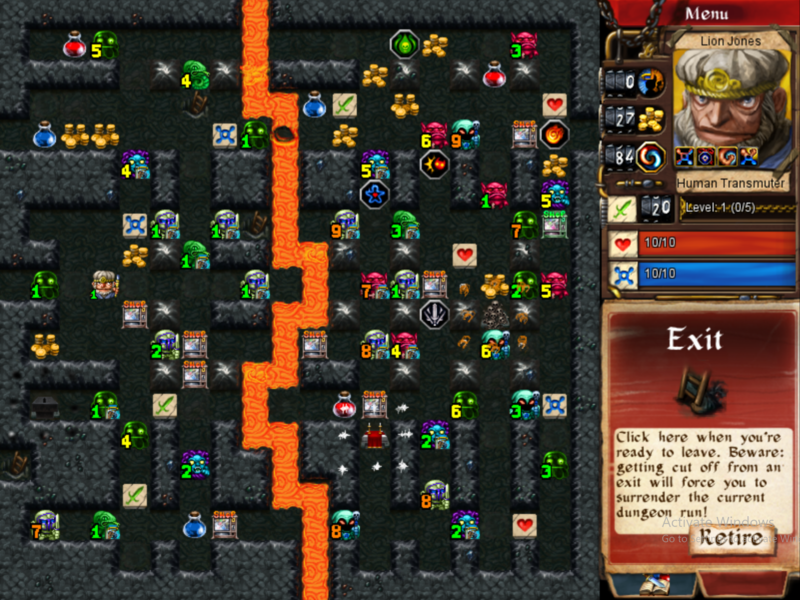 Boss Parade difficulty is now affected by the dungeon's difficulty multiplier. Endless Blizzard Curious was fully remade. Best of luck, although this time you'll be responsible for making your own. Phantom Citadel Curious was revamped to both undercut experience-mongering strategies and make the challenge more interesting. In Vicious Steel Curious, the Indomitable is isolated and delayed until the end, making the dungeon less weak to knockback shenanigans. Lava? In the South? What could be going on here? Dungeons are done, though still need some balancing. The South’s dungeons present quite a range of unique new challenges while also boasting some of the most awful monsters to date. Think unstable is a pain? I did too, once upon a time. Hate Frostbite? You’ll wish these monsters had frostbite instead of their brutal cocktails of traits. Fortunately, there’s only one simple new trait, so you won’t have to learn how something like Unstable or Riposte interacts with everything else. Meanwhile, some of the dungeon gimmicks in the South put earlier designs to shame. 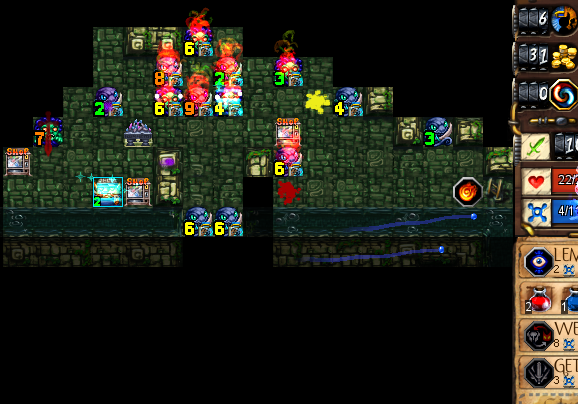 One of the Vicious dungeons messes with the standard formula for proper play so much that I still have no idea how to begin optimizing my runs. 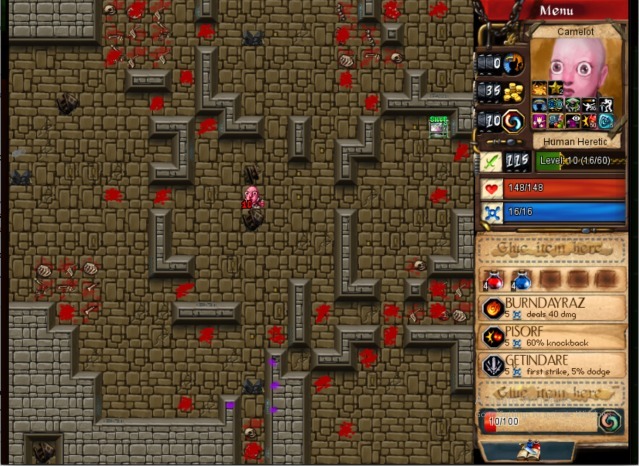 Another dungeon plays completely differently depending on certain key choices you make in-run. Classes are in a similar state to dungeons. The main class for the South (our level 4 Thief Den inhabitant) isn’t as crazy as Heretic, but does bring his own new concepts to the table and raises real questions about how you should spend your blackspace. However, even with the simpler design the class challenges will really stretch your ability to play properly. The bonus class is… strange. While it isn’t a monster—you’ll have to wait until the West for that—it brings more uses to its starting glyph than any class to date, and can be played in a large range of ways. Last for primary stuff would be quests, badge, and items which aren’t quite done. That being said, I can assure you that the badge will be another significant and unique experience like Curious. The items also bring some new concepts and decisions to the table, but saying much more than that would be a spoiler. Other than primary content, a few fun things are brewing behind the scenes. Spleen is currently drawing Bard portraits (occasionally on his stream too, so feel free to check that out and watch him work). A puzzle pack is in the works that is… actually a puzzle pack! You know, instead of a tutorial or masochist’s exercise in static Desktop Dungeons setups. All-in-all there’s a ton to look forward to. Of course, with things still in development I won’t commit to any sort of prediction of release time, but we figured this update would be a kindness to any and all starved for news of how development was going. Hopefully you enjoyed this brief distraction, now get back to managing your Kingdoms! 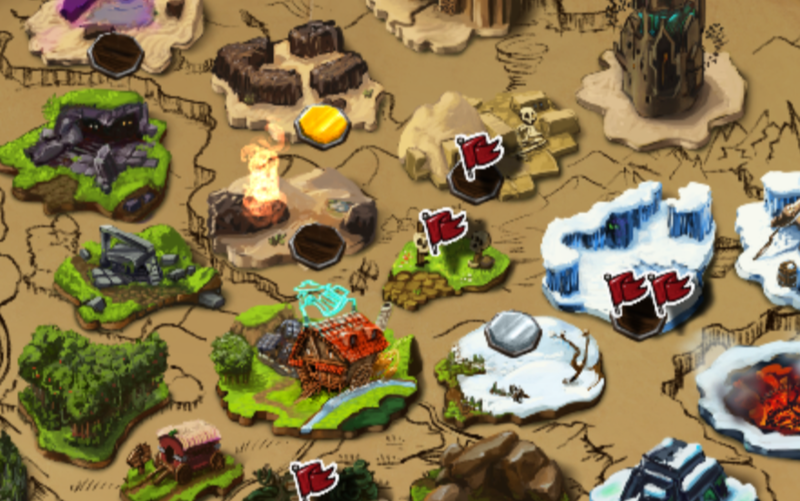 Hmm.... What could that suspicious quest flag be? And on the Kingdom no less! Something strange is clearly going on here, and, if you think about it, the only logical course of action is downloading the new patch just released to go figure it out. In all seriousness though, this little patch adds a fairly lengthy multi-part quest line (although, depending on skill, your mileage may vary) that is... unique. For that very reason, I'm not going to say any more other than that it will unlock for those who have already played through the mod after finishing any run. For those of you who haven't played the mod, what are you waiting for? Even if you aren't interested in new challenge dungeons or items, I'd argue this is worth checking out for novelty's sake if nothing else, and you'll run into it quite early on in the mod. As for where we're going from here, it's down to the South! Swamps, serpents (but not Naga, we're all sick of those), and all sorts of new and terrifying foes to encounter. Furthermore, the South is a bit slimmer than the East (partially due to having one less dungeon, partially due to not having as many new monster traits, and partially due to not requiring us to recode a large potion of... everything) so hopefully we'll be able to get around to it sooner. Then again, per always, things take longer than expected, so I won't commit to any sort of deadline. That being said, once things are further along I'll update News again to keep everyone informed on how things will progress from there. It might be spotlight updates, like the East, or maybe I'll just suddenly announce it's coming out in two weeks. Either way, just know that more is coming. Curious badges for all the Extreme Edition dungeons! Fixed Fighter instincts on Cursed Oasis. Damage prediction on corrosive enemies was wrong. The Eastern Patch is almost ready for deployment. It’ll be bringing you the remaining curious dungeons, changing up a few curious dungeons (most notably The Slime Pits, which are now way cooler, and VGT which is still impossible but now technically doable for things that aren’t Vampire), lightly tuning a few Eastern dungeons and items, and fixing heaps and heaps and heaps of bugs. And probably adding a few more bugs to fix next time, despite our best hopes and effort. As for when you can precisely expect that, the answer is probably by the end of this Easter weekend. However, if something horribly game breaking pops up at the last minute it might be the weekend after that. Also, since it is an East-er release (and since we feel bad about being a bit behind and that awful pun), there is a planned bonus questline which will include an Easter egg hunt of sorts with a prize at the end! It'll probably drop a week or two after Easter (unless things go exceptionally well), and will be quite different from anything in the game so far. Looking past this Eastern update, the South is on the distant horizon. Like the previous two regional updates, it will include two classes, many dungeons, multiple questlines, a badge, and more! Additionally, there will be quite a bit more art coming in the South than the previous two combined. If all goes well, you can expect a full set of 14 portraits and sprites for the already existing new classes (created by the wonderful Spleen, who also did the male magician art) and potentially full art for the new Southern classes as well. Although we’ve started preliminary work on it, the South is still miles away from completion, so we’ll keep you updated as it takes shape and we figure out its release window. Fortunately, that release window should be sooner than expected because we are officially welcoming Srid to the team! While avid QCF forum readers have probably seen him on there answering questions, this is to inform those of you who don’t that we've added another skilled coder who knows the game like the back of his hand. At the very least, now zayyeh doesn’t have to build everything from scratch himself. That’s all there is to be said for now, so look for our post on here, QCF, and Steam this weekend (or the following, but hopefully not) to get the patch hot off the presses! I'm not going to waste your time with fancy words. Just go to our download page, follow the instructions, and get to playing the East! Per always, we'd love it if you leave feedback over on the QCF Design Forums or the Steam Forums. I'll be straight to the point on this one: Release will be on Friday, December 15th. Details on download and installation will be added to the Download page when we put out our release post. Well the break was nice, but now we’ve returned, bigger and better than ever. And yes, I mean that quite literally. I’d like to take this week to introduce you to our third team member: Everyone please give your utmost thanks, praise, [INSERT POSITIVE FEEDBACK], etc. to Spleen! Spleen is a fairly regular member on the QCF forums, so I’m sure more than a few of you know him (and his terrifyingly efficient speed running skills). Coincidentally, he also happens to be good at digital art and approached us awhile back about art for the mod. Ever since then he’s been working from the shadows, beautifying the upcoming update with new sprites and more. So what effect will this have in the immediate term? 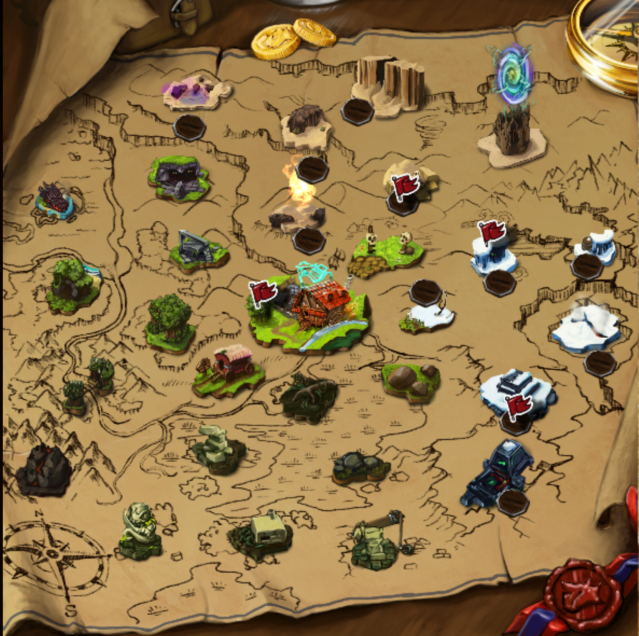 The Eastern update will include on-map dungeon completion indication (the standard silver, gold, rainbow fare). There will also be some new art sprinkled throughout other more minor areas, like items and monsters. However, the biggest improvement is the magician! The magician will have a full slate of brand new male sprites and portraits, and you can see the portraits now over here if you want to: imgur.com/a/sOfxI. As for the long term, if all goes as planned, all of the classes will eventually have new art. This update is more of a teaser than anything (I don’t like this trend of them getting shorter and shorter…), and there will not be an update next week due to Thanksgiving plans. Fortunately, the update after Thanksgiving will be a nice surprise. I promise! Anyways, onto the main topic. Protective Blessing is one of the new traits coming in the East, and its quite a bit different from anything else, because a monster with Protective Blessing X% gains no direct benefit from the trait. Instead, all other monsters within a 5x5 square centered on the blesser gain Protected X% (X being the same number as earlier). Additionally, if a monster is in the range of multiple blessings, the Protected percentages stack (which can allow a two monsters with Protective Blessing to boost each other, and double boost monsters between them). Protected acts exactly like extra physical and magical resistance, with two exceptions: 1. It cannot be eroded by BYSSEPS, Binlor, Cursed Cutlass, or any traditional resist reduction methods (although RBS can still circumvent it). 2. The provided magic resist only affects magic damage, and NOT cast success chance for glyphs like IMAWAL, WEYTWUT, or WONAFYT. Fortunately, the Protected trait is not permanent. It can be removed by either killing the monster with Protective Blessing (easier said than done, in some cases) or by moving either party out of range (although moving the Protected Blessing monster may suddenly make new monsters Protected if you aren’t careful). In the spirit of keeping these spoiler-light, I’m not going to name any monsters with this trait or explain any of the circumstances in which it is used, but know that it usually ends up being a pretty meaningful consideration. Alright, that’s all for now, folks! Enjoy Thanksgiving if that’s a thing for you, and look forward to what we’ll have to share when we come back. ​More subtle spoiling of a certain new trait, for any who want to try to piece it together. Unstable and Corrupting Aura: Both of these effectively received the same two changes. First, they are now separate damage sources from the main attack. The upshot of this is that they now horribly murder you through your death protection. If the monster’s main attack breaks your DP, its aura or explosion can and will finish you off. Of course, if the monster’s main attack does not break your DP then Unstable/Corrupting Aura will do the job instead, per normal. Fortunately, we’ve adjusted the predictor to handle all of this, so no need to double check yourself when it comes to living or dying. The second main change is that they no longer technically deal damage. Instead, they remove health from you. While this may sound like a semantic thing, what it translates to is irreducible damage. No matter how much resist/DR/corrosion/frostbite you have, the unstable/corrupting aura portion of the damage will always be unmodified. Additionally, as unstable/corrupting aura aren’t attacks anymore, they do not piss off Tikki Tooki, cannot be dodged, do not remove frostbite, do not inflict status effects/death gaze, etc. They just remove health. Pure, simple, unavoidable, and cruel. Riposte: Riposte falls a bit in-between the original versions and the new versions of Unstable and Corrupting Aura. It has been separated into two damage sources (so no ignoring it with DP), it cannot be dodged (trying to work dodge prediction with two separate strikes proved to be too much of a mess), and it is not counted as a hit (looking at you, Tikki Tooki). Beyond this, it is like a standard monster attack: Its type is the monster’s damage type (and can thus be reduced), it can inflict status effects (meaning it nails you twice with stackable status effects on physical attacks), it can trigger death gaze (so if its original hit puts you under the death gaze threshold, the riposte will kill you), and it does remove frostbite. Frostbite: The changes here are far more straightforward. For simplicity’s sake, Frostibite’s damage adding effect basically works like corrosion now, instead of stacking a separate magic damage attack on top of the enemy damage. So if you have enough DR, you can clear your frostbite without actually getting damaged by it, but otherwise it will always deal its full number’s worth of damage. TL;DR? Don’t worry. The puzzle pack in this expansion is Trait Tutoring. Trait Tutoring is a sort of Agbaar’s Academy for all EE monster traits. And the puzzle difficulty has been bumped down from masochist level to your standard base game puzzle fare. These puzzles are designed more to let you know about the nuances of the traits than to challenge you (although that doesn’t mean they will be easy). Furthermore, this pack will be updated as more traits are added in future releases. So yep, that’s it for this week! Progress inches slowly closer to a releasable product, so, in the mean time, feel free to stress about how much harder things will be without DP as an easy way out strategy. Who's the real demon here? INDULGENT is the most straightforward ability heretics have. They literally cannot lose indulgences (and thus piety loss is not prevented), and gain 1 base damage and 3 health for each one. Furthermore, for each odd indulgence (1, 3, 5, etc. ), they gain 1 mana. So in a typical run, this nets you 18 health, 6 base damage, and 3 mana. BLASPHEMOUS, while also mechanically straightforward, is a bit more interesting in-run. Any time you lose piety by angering a god, you are instantly granted 3 CP per piety lost. Caveats are the following: 1. Pacts are not angering anyone (on the piety panel they are white, not red). 2. Piety must be actually lost to gain CP (so no easy TT CP farming). Another thing worth noting is that heretics' immunity is to ALL punishments, whether from desecration or piety loss. Last, but definitely not least, is OBSCENE MISSION, the defining ability. Altar scouting is exactly what it sounds like (and also identical to the altar scouting prep from way back in beta days). Inability to convert or desecrate is also simple: When worshipping a god, the buttons that say "Convert" and "Desecrate" on other altars will always be gray. 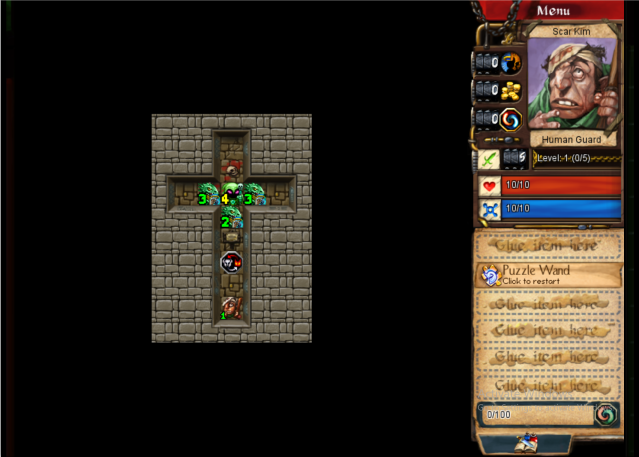 Thus, all that remains is the interesting part: "auto-desecrate worshipped altar on level up and reduce piety to 0." This means that every time you hit an EXP threshold (prestige levels included), you smash your current altar (even if it is unreachable). This grants you 3/2/1 indulgence(s), ends your worship, does not punish you, and sets your piety to 0 (without giving you CP, although Binlor's -10 piety for leveling triggers first for up to 30 CP). Pactmaker cannot be desecrated, and is thus exempted from the whole mess. Furthermore, your piety is only set to 0 if you actually smash an altar, so piety to fuel pacts will stick around between levels where you aren't worshipping (although you'll need sparkles/stone sigil/consensus to get any). One last benefit of this is that you get the starting bonus (piety, glyph, etc.) from every god you worship. Basically, it's a bunch of plusses with the drawback of not really being able to hold on to any god. Not to mention that if you want to get good value out of INDULGENT you'll have to sacrifice an altar or two early. So that's the short and long of it. We promise it's more intuitive to play than the exposition suggests. Is it crazy? Yes. Is it boatloads of fun? It's my new personal favorite class (take that how you will). Does the way it play vary pretty drastically by god spawn? No question. Is it overpowered? Probably a bit, but it's not the only class in that category. That's all for now, folks! We hope you're drooling with anticipation and all that. Feel free to comment, speculate, ask further questions, etc. down below! Also, don't expect future spotlight updates to be quite as substantive, since Heretic is the only big thing available upfront (and thus isn't really a spoiler). Future spotlights will likely be on more minor additions/improvements, although there might be another big announcement in the works for one of these. We'll leave it to your imagination. News Update: The Expansion isn't Dead! Greetings, one and all! Greetings and... humble apologies. We've realized that hearing nothing official from a fan project for a solid chunk of time conjures up the specter of abandonment. So here is your friendly news update to assuage your fears! First and foremost, know that we are working steadily and plan to finish the mod. Progress has slowed slightly due to real life circumstances for zayyeh, but we've finished most of the content for the next expansion (polishing and bug fixing still remains). With that in mind, we figured it would be nice to give updates from time to time, so expect the occasional posting up here just to remind you we exist. Additionally, we want to build interest a bit before release, so we will be posting spotlight updates daily the week of the release. These updates will highlight non-heavy-spoiler things (so no dungeon explanations, item spoilers or anything else major/hard to access) coming in the East that we think are fun or interesting. That way you have some idea of what you're getting when you download the next patch, as opposed to having to go in blind. In the meantime, if you're starved for Desktop Dungeons content or aren't sure whether you should download what we have currently released, the youtuber Captain Thief has begun a Let's Play of the Extreme Edition content. So check that out and give him a like/comment/subscription if it peaks (this was definitely an intentional pun and not a mistake that I realized was a pun) your interest. Despite everyone's best intentions, the kingdom is still in an unflatteringly upheaved state. Codexers were writing in invisible ink, Vampires were masquerading as gnomes, Bards have started whining nonstop about being half-blind now, Tiki Tooki was being EVEN MORE of a jerk than usual, and some guy guitar soloed so hard that the time-space continuum was temporarily ruptured. And that's just the start. - Codex effects should stick for good this time. - Sorcerer no longer breaks everything, but mana shield prediction had to be disabled for the time being. - Titan Guitar is no longer crashes the game. Rock on, fellow Administrators! - Tiki Tooki should now deduct piety more properly. - Ancient Scrapyard is now more interesting. It's unclear what ramifications this had on difficulty. - Hidden Workshop is now a more straightforward challenge, and likely a bit harder. - Cursed Cutlass resist erosion lowered down to 3%. - Debtly Surprise cannot unlock before Vicious Steel. - Lekon's Chosen are quite a bit beefier, and hit slightly less hard. - Errand Boy, pt. 2 changed to reflect the fact that race requirements are secretly non-enforceable. - Vessel of Lekon interaction with knockback is a bit more straightforward now. So you can't just infinitely corrode him. - Vessel of Lekon difficulty slightly tweaked. - Undying Sculptors are now CHAOTIC! - Undying Sculptors now create golems that RIPOSTE! - Grudge Match puzzle is now slightly harder, to reflect a more optimal solution. - Better enemy distribution on Lekon's Table. - Refund Wand is now less amazing, and Membership Badge now converts for a boatload of CP. - New monsters now petrify into real statue types. - Stone Jellies now look like stone. - The One Horn now has an extra effect to make it better over the course of the run. - Bard's EYE OF OPPORTUNITY completely redesigned to more fully reflect the style of play intended for the bard. - Bard Gold now auto-scouts TT's altar due to the loss of bard scouting. - Soul Eaters now ESSENCE DRAIN! This makes them harder, but still more fightable then they were previously. - Sapphire Golems which inflict FROSTBITE have joined the new golem crew in Flooded Foundry. Be very careful with them. - Lekon's Table now has an extra fancy effect to compensate for the increase in Lekon's Chosen health. - SMOKE AND MIRRORS description clarified, now applies to Frostbite as well. The recent months have been a real adventure, but things finally seem to be settling down. Your new professionals (and one obnoxious self-proclaimed seer) have finally finished moving in. 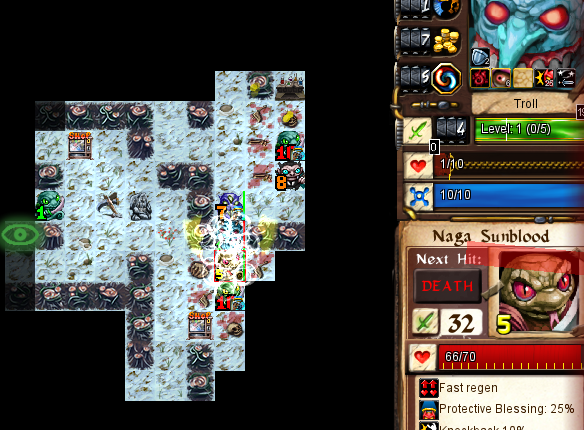 The Northern dungeons now feel only slightly mysterious, while still being mostly a real pain to win. Hopefully things will be normal for a little while, but that might be too much to ask for. After all, who doesn't enjoy a little random craziness showing up from time to time? Recent rumors have been turning your head eastward. They speak of lost expeditions and the coveted secret of immortality, but it is probably mostly made up. Rumors are notoriously unreliable, despite their 100% correlation to reality. Really, how do the old men back at the tavern figure all this stuff out. Well, these mysteries will have to be left for another time. For now it's time to kick back, relax, and enjoy your new guests and more. - Flooded Foundry... changed? Hopefully it is a little harder or something maybe? You tell us. - Bezar is now offering a new, preppable refund initiative! Nothing much is happening in the Kingdom right now. After weeks of turmoil and strange visitors, everyone is enjoying a brief moment of rest and breathing large, collective sighs of happiness. The monsters have really made the most of their brief moments of non-upheaval, putting on makeup, making sure they explode properly and such. Adventurers have been far less productive (as expected...), but even they have stamped out some bureaucracy, making sure they get their badges and gold as appointed. More tiny fixes, fine-tuning and art! You'll probably have one more week of this followed by the release and then finally new content again! Or a break. Our coder deserves a break, so we'd feel bad not giving him one. Anyways, enjoy quests and stuff and give us all the feedback you can, because this stuff will be finalized soonish! Without further ado: Changelist! - Cloud Save buttons disabled, so you can't accidentally ruin your saves. - Scrooge no longer unawards itself. - Old portraits restored, promoting greater gender equality! - New installer for Windows. Ever since a certain questionable seafolk robbed a certain well-known monster merchant, rumors have abounded about strange people arriving from the sea. They've come in droves, bringing new toys and new warriors. These swashbucklers seem to have an expert grasp of swordsmanship, and, despite lacking the rigorous workouts of our standard adventurers, dance with an unparalleled style and grace. One of the favorite items they have brought with them is a box of puzzles. However, this "toy" has been found so challenging that some have begun to consider it a torture method instead of a fun distraction. Still, for the wise, inquisitive, or stubborn, they may provide some enjoyment. - Master Pack added. We hope these are solvable. using limericks to explain its data. The first thing to note is the Bard. He got challenges, and they're hard. And forgot some old lore to regard. Although they might not be for you. and nerfed a few thugs. It was a good week for the crew. I hope it's clear why I haven't pursued a career in poetry. Also, remember how I keep saying we'll be done in a few weeks. Yeah, I'm going to say that again. And since all major content is done now, I might be right for once. But probably not, given my track record and how we keep adding new, unplanned stuff. There is one thing I never get wrong though: I always call that a changelist will follow. - Bard class challenges added! - Bards are Tinkers, as they always should have been. Not sure how we missed this for so long. - Magic resistant monsters have realized they are now officially allowed to ignore Bards. - Bards got rid of the Kingdom screen musicians who were annoying people to death. - Dungeon music reverted until when (if?) a more complete extra soundtrack exists. - Class challenges no longer in menu quest display. - Removed smuggled escape staircase that was hiding in plain sight in the Magician gold arena. - Kept making Magician gold easier to make winning more consistently possible. - Fizzzz is slightly less screamy if you break the rules. - Temporarily removed Magician gold's reward to give it to Bard gold. - Siabrae stopped being the absolute worst all the time and Soul Suckers are still the worst all the time, but are slightly more interesting. - Top secret Bard subdungeon has retreated to the shadows, but been fixed. - Wanderer stopped appearing where he should't on dungeon panels. - Dungeon color (rainbow, gold, silver, you know) fixes. - Codexing scribes finally started spending 1% of their time checking for things like typos, numbers, etc. - Quest flags minority changed. While it is common knowledge that adventurers rank among the most narcissistic people alive (surpassing actors, and being slightly edged out by lawyers), the alchemist's recent invention of a transformation potion has caused widespread issues. Magicians, self-conscious about their unusual coloring, have converted to an arguably even more unusual coloring. Bards and Bishops have also latched on to the new brew, eager to look a little more special. The isn't the only thing Bards and Bishops aren't stopping there though. In shocking move only ever performed before by the Order of Transmuters, the Guild of Bards have changed their standard style for approximately the 15th time. Bishops, discontent with merely shifting around their worship willy-nilly, have begun increasing their questionable activities. The new deal they've struck with the Pactmaker seems especially promising, although it cost them some of their favor from the other gods. Finally, after determining that the finalist in the Grand Wizardry Tournament™ might be literally unbeatable, the Adventurer Fairness and Welfare Committee forced the inclusion of a few more purchasing options. - Magicians are purple, Bards are Priests, and Bishops are Monks. - Bard revised for the umpteenth time. This one should stick. We even gave it skill icons to make the blasted thing stay. - Bishop is slowing morphing into a final, more Pactmaker focus version. It will probably change one more time in the next few weeks. - Scrooge no longer ruins your PQI. - If you haven't upgraded buildings, they are now full price. Sorry. - Super secret code efficiency improvements. All sorts of unexpected things have been happening this week! Monsters have begun throwing epic parties in dungeons, and (slightly less surprisingly) adventurers have been murdering them wholesale. They've even started awarding a medal for doing it. A grand wizardry tournament has begun, and a few ambitious magicians are entering, hoping for prizes and fame. Even Bezar has a new magical curiosity of an item, but it is only on offer to those who earn via tournament success. - Magician Class Challenges added! - New item: Bag o' Tricks! - Boss Parade updated to make it more beatable. - Magician and Bard are no longer so blue. - Magician now shows up greyed out in the Mage Tower. - Prototype 1 now always displays No Experience when he should. This update is very small. As such, these patch notes will be small as well. We hope you gain a small amount of happiness from this update. - Magicians now remove debuff skills instead of resists. This incredible change has led to them deciding to get a makeover. - Hidden fun thing you might find. - Boss Parade slightly amended. - Evolvia figured out how to change colors. - The Sacrifice stopped being racist against monster classes. - Messy class icons popping up all over the place shouldn't anymore. - Hitball guys are no longer necromancers on Haunted Castle. - The witch has gone back into her building, avoiding dungeons for the time being. - Miscellaneous bug fixes and improvements, just in case I've forgotten something. What a lucky break! That sandstorm actually totally missed everyone, so all dungeons are still accessible. Rumors claim it is the work of the secret underground group "Questonymous" (they also run PQI), which didn't want the storm to trash all the secret quest setup they've been doing up North. In less lucky news, the Auditors have continued their brutal review of all of the Kingdom's policies. They found the veto slots (vaporized), the questionable DERPing (banned), and the policy of not paying adventurers (still mostly a thing). In their righteous fury, they even emptied out the legal locker and veto slots as punishment. To top off the whole debacle, someone lost all the dungeon records while trying to hide suspicious paperwork. Fortunately they should turn up after completing a dungeon run. Not everything is terrible though. Bezar has officially started a membership campaign for adventurers willing to pay the fee. A few heroes are so happy about this that they've taken up singing and become Bards. We do not recommend their concerts. Some old guy keeps saying there is a secret sword amongst Bezar's shop. This old guy is probably crazy. - Bards now roam the halls of the Explorer's Guild, too nervous to actually sing to anyone but the monsters. - Bezar's Tentacular Savings Club is officially open for members. - New classes are now charging tiny mostly-one-time fees, as is the Bazaar. - RIP extra veto slots. - Records of Lockers, Vetoes, and Dungeon completions are flying in every direction. Good luck. At the very least the dungeon ones should come back after one run. - Auditors also found out about the new classes and items, and promptly disqualified everyone from the DERP program. - Class completion panel is properly organized now. - Lekon lore books no longer randomly appear in the South. - Possessed Goats look slightly less horrifying, as does The One True Horn. - Cursed Sword might be waiting for you in a locker slot once you've upgraded the Guild. As in I'm literally not sure if it will spawn or not. I hope it does. It's cool. - PQI no longer discriminates against Trolls. The New Year has arrived, bringing with it brawls, festivals, and festive brawls at festivals. Foremost among the festivities is the New Year Talent Show: a tournament where adventurers of every variety try their best to show off for a hefty prize. While the past few years have been dominated by a dancing Troll known as Bubbles, this year had a few noteworthy new entrants. First, some of the more rebellious priests promoted themselves to bishops and gave a lengthy sermon about nothing in particular. It seems their new position comes with an even greater ability to be noncommittal about religious specifics while still sounding extremely wise. This infuriates the paladins to no end. Second, after spending the past day and a half camping, some rogues have decided to be hunters. These "expert naturalists and survivalists" showed off their newfound skills by butchering a ton of plants on stage. This impressed no one. Unfortunately, no winner could be declared, as the judge panel was secretly murdered by magicians. It seems they'd been taking a seminar at the Thief Den on bullying weak opponents, and couldn't wait to test the fruits of their labor. With festivities settling down and paperwork starting up, a few worrying reports have arrived. They warn of strange golem-related subdungeons appearing up north, and an approaching sandstorm so massive it could hide the new adventuring destinations and force you to actually quest and such to find them again. Worst of all, the Auditors have decided to take a more thorough look at your adventuring practices. They've already forced you to remove your over-inflated locker (apparently storing dangerous items in civilian housing is "irresponsible"), and next thing you know they might make you pay your adventurers. Just kidding. What a ridiculous idea! - Bishops have taken up residence in the Church, and promptly started annoying the Paladins with their wily agnostic ways. - Hunters now stalk the halls of the Thief Den, randomly laying traps and laughing at the unfortunates who fall into them. - Magicians have pick up a few dirty tricks to crush slowed monsters. - More lore subdungeons litter the north, filled with items and such. - New items and Flooded Foundry now save. - Oasis Town subdungeon walls stopped randomly detonating. - Cursed Goats are no longer smart enough to revive as pacifists. - Corestones are no longer smashable on dry land. - Sprite coloration is more consistent for classes. - Plants stopped shoving trolls around. - Trolls have learned to hide in subdungeons. - Troll shroud animation is distinct. - Trolls no longer spawn CYDSTEPP. - Djinn's IMAWAL looks amazing. - Bloodmages have reclaimed their old spot on the adventurer selection screen. - Infinite-Locker disabled (if you post to ask for it, we can give it to you, we can't officially post it). It's holiday time around in the world of Desktop Dungeons! The tavern is filled with raucous cries from drunk, underpaid adventurers. Orcs have redecorated with new, equally tasteless, albeit more festive decorations. Even some monsters have adopted a special Christmas look, wearing Santa hats and such. Yeah, no. Maybe next year. Instead of being filled with holiday spirit, the tavern is filled with rumors about a secret foundry where golems are being produced, somewhere near Cursed Oasis. But they are rumors though, so take them with a grain of salt. The only real act of holiday generosity, came (to everyone's shock) from the Kingdom's Bureau of Adventuring, Records, and Filing (BARF). BARF has actually recognized the recently-discovered dungeons as worth spending the paper to write about, so standard heroes who travel to these new destinations will finally have their achievements recognized and kept in Kingdom records. We hope. Filing mistakes do happen from time to time. - The Flooded Foundry awaits someone actually good enough to beat it. 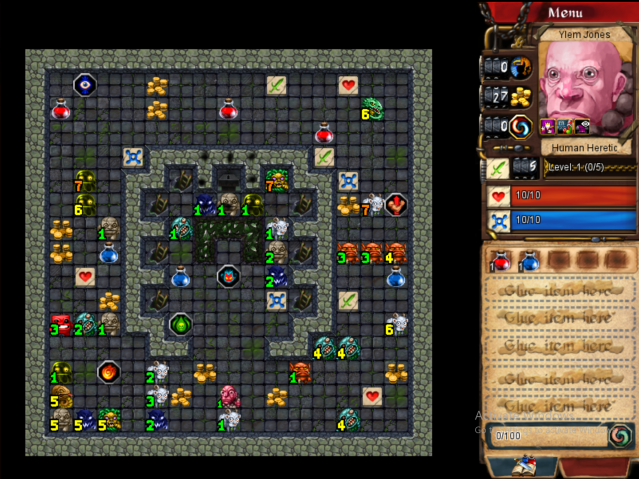 - New dungeons should *hopefully* save victories and badges earned by the original classes. Please post any crashes related to this. - A certain goat in a certain subdungeon should drop a certain cutlery item. - The Hitball Administration is happy to announce they have properly set up in Darkwood Fringes and should no longer break everything when spawning as the subdungeon. - Subdungeon monsters in Ancient Scrapyard are no longer ancient and properly award exp. - The blacksmith kicked out the pesky Djinn who was living in his level 1 building. - Vessel of Lekon's resist cap no longer capped at a mere 20%. - Vessel of Lekon actually gets buffed by vicious token. 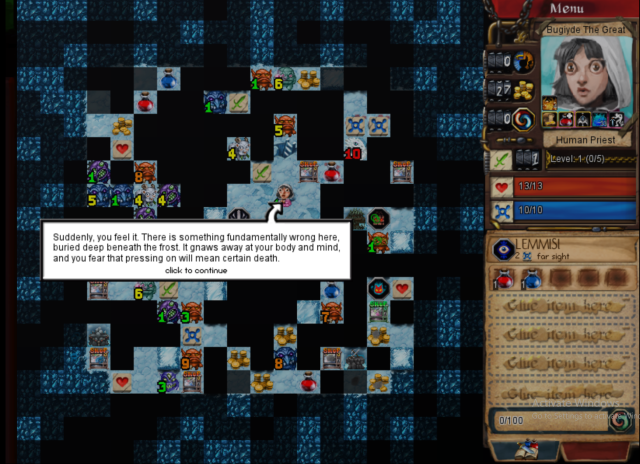 - Class panel on dungeons can now properly handle the extra rows of classes. - Unstable monsters explode no matter how you kill them. Week 1: Welcome to the Wonderful World of Weekly Updates! Hello, everyone, Avatar here! In order to make things more regular for you all, we're shifting over to weekly updates. You can expect these to be rolled out sometime every Friday (EST time) accompanied by patch notes and a changelist. Things may be a bit bumpy at first (we're new at this), but hopefully this will make testing and keeping up with the mod easier for everybody. On other good news, we've finally gotten the devs official approval! Things are still to be kept secretive for now, but expect some new (or old, rather) faces from the QCF Design forums to be showing up in a few weeks or so. As for the actual update, I'll let the changelist speak for itself this time. Wouldn't want to make you read too much. - The Hidden Workshop has been discovered up north. - Four new subdungeons have been added. They may be rather hard to find. - Soul Sphere, Lord Soul, and Cult Talisman added. - Troll is no longer by far the most fiddly class ever invented. - Wanderer's BLOOD MIRROR reveals 5 tiles instead of 7. - Deadman's pass has an original soundtrack. - Desktop Dungeons Alpha nostalgia-inducing sound effect added. I won't spoil where, but any of you who've played the alpha will find it real quickly. - Corrupting aura has been updated.